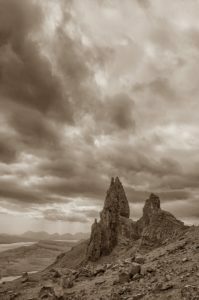 Welcome to Skye Roots: – research and reporting of family history and genealogy for anyone with links to or ancestors from Scotland’s Isle of Skye & the Island of Raasay. The Skye Roots archive is the life-long passion of Skye woman Norma MacLeod who researches, draws together and preserves the fragmented wealth of local Skye family history for the benefit of people around the world. Originally started as a hobby over 30 years ago, Skye Roots has gathered momentum, collating information from a huge variety of sources including Census Returns, Old Parish Records and (from 1855) Statutory Records of births, marriages and deaths as well as books, oral traditions (including patronymics), local knowledge and contacts. At an early stage, Norma realised that the sum of the whole would be greater than the individual elements. ALL information found is entered into her personal, specially-designed computer database. Checking out everyone living in a given area, rather than only one specific family, can identify relationships that would not come to light using conventional research methods. Research: Skye Roots research service is affordable, whether to expand your understanding of your own family tree or as a present for a friend or relative. Skye Kin: The Skye Kin archive covers the parishes of Duirinish and Bracadale in north & west Skye and is now held by Skye Roots. Norma published her book “Raasay: the Island and its People” in 2002, which traces the history of one of Scotland’s most beautiful islands from the medieval period right through to the 20th century. For some time now, Skye Roots has been gathering and collating information relating to Emigrants – Skye-born people who have left the island. Descendants of these people are now throughout the UK and around the globe, particularly in North America, Australia and New Zealand.